At least the oysters were delicious. The episode started with Beth hitting on Richard. Richard looked like he was just humoring her. With that romance aside, the chefs were woken up by three guys on off-road motorcycles. Outside Hell’s Kitchen, Ramsay had those three cyclists ride in one of those round cages you see at county fairs. The chefs thought they had to go on those motorcycles and into the cage. Instead, Ramsay told them they’d be riding tricycles. The chefs worked in pairs to ride tricycles to a cooking station and complete one of five skill drills. The drills were: peel and devein twelve shrimp, break down two chickens, shuck twelve oysters, fillet four trout and make two egg white omelets. The men quickly came up with a plan while the women just argued. Once they settled on a decision, the first up were Demarco and Richard for the Blue and Kashia and Bev for the Red. Anyone who’s ever seen fully grown people riding tricycles knows that it’s hilarious, especially when they are really big men. Add circus music to the mix and it’s pure gold. 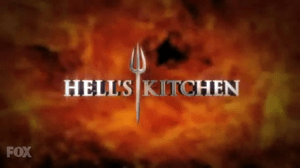 As usual for “Hell’s Kitchen,” the points go back and forth until it’s tied. The final four were Gabriel and Ralph vs. Rochelle and Joy. The Blue Team chanted “azul! Azul!” Gabriel and Ralph managed to finish first and give the Blue the win. Normally, it’s the Red that wins all the time. Nice change of pace. Blue’s reward was a day in San Francisco, where they ate at Epic Roasthouse. On top of that, they had a tour of the city on Segways. The Red had to go to a carrot farm and pick carrots. Later, they had to bring those carrots back and clean them. Sous Chef Andi quizzed the Red Team on the menu while they were making carrot stock. It degraded into an argument between Kashia and Nicole because Kashia says Nicole speaks way too low. The dinner service that night, while much better than the previous night, had a lot of major problems. In the Blue, Jason made a salty risotto. He redeemed himself afterwards. Mike started off his table-side raw oyster service by servicing a Red table. How in the world did he not notice the red plates on the table? Apparently Demarco does not know what sear means because he put a tuna in a cold pan. Twice. Entrées time came along and Scott was way ahead of Gabriel. He put up his halibut way before Gabriel had time to finish his chicken. To nobody’s surprise, the chicken was raw as well as the halibut. Gabriel’s second raw chicken caused Ramsay to throw out the entire Blue Team. In the Red, Simone started things off by under everything a risotto (not cooked enough, not enough butter, etc.) She immediately followed that up with the same mistake. Ramsay told her to “*bleep* off” and made Nicole take over. Nicole’s first risotto had almost no lobster in it. She then made one with a ton of pepper in it, causing her and Simone to get thrown out. Ramsay really lost it when Beth brought up a cold lobster tail. Once it time for entrees, Beth misplaced the tray of halibut. She found them, though-and then overcooked them. This woman is all over, huh? She tops that off by making a raw halibut and causing the rest of the Red Team to get booted. At elimination, the Blue put up Demarco and Gabriel. The Red had Beth and Simone. Ramsay eliminated Nicole. It’s sad really. This show is up to its twelfth season and nobody has bothered to practice risotto, halibut and chicken. Three of the five most used dishes in Hell’s Kitchen are still getting destroyed. Good thing Ramsay said that he’ll start eliminating chefs at a much faster rate. If that’s true, this’ll be the shortest season yet.